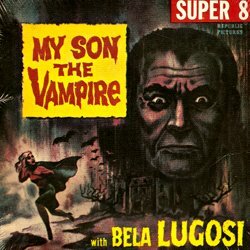 Also known as Vampire Over London, My Son The Vampire, The Vampire And The Robot, and The Vampire, Mother Riley Meets The Vampire was Bela Lugosi’s third and final British film. 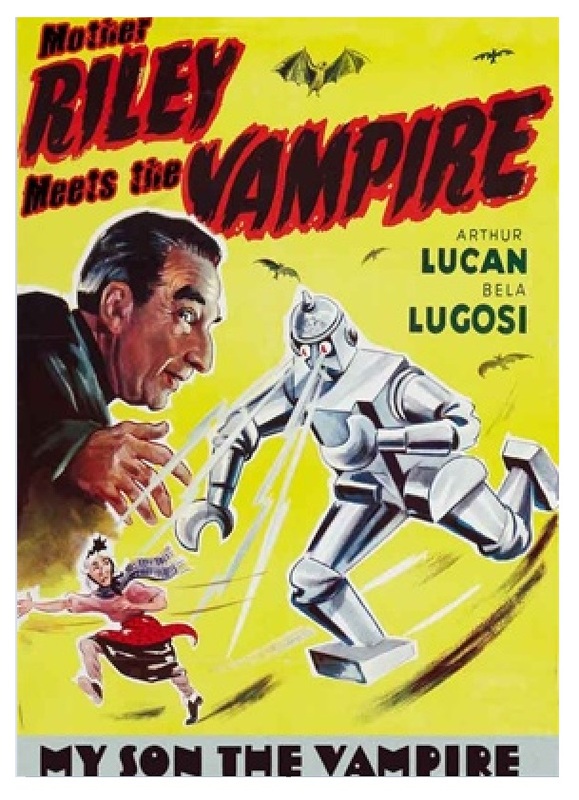 A thinly veiled reworking of Abbott and Costello Meet Frankenstein (1938), which featured Lugosi as Dracula, it was the last in the successful long-running series of films starring Arthur Lucan as the Irish washerwoman Old Mother Riley. 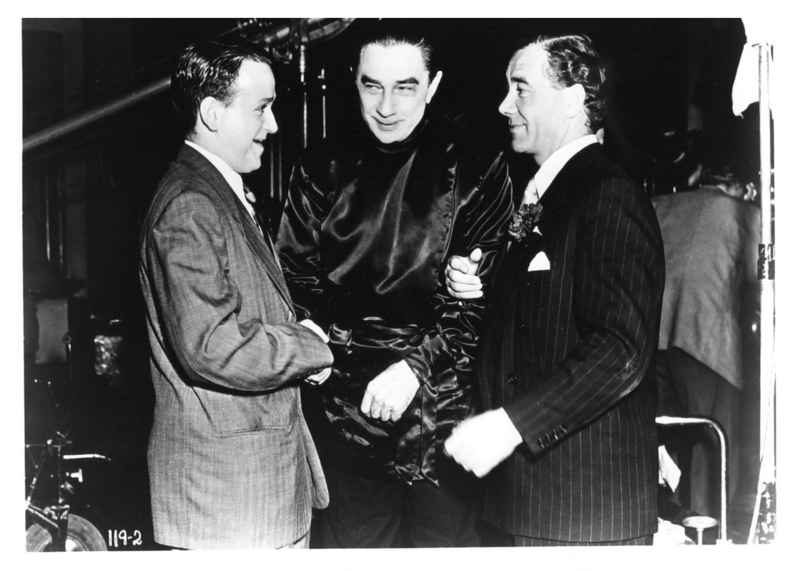 Production on the film began 24 days after Lugosi finished a 27-week UK revival tour of Dracula. 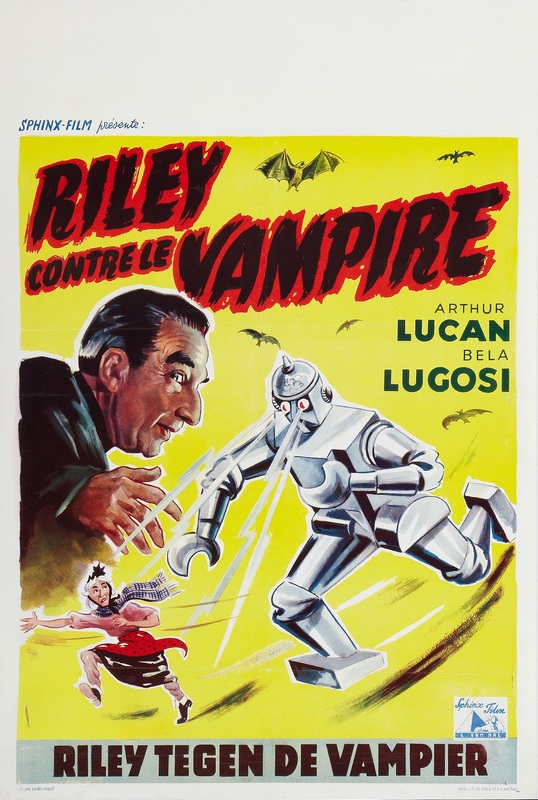 Popular legend holds that the film was hastily arranged to provide funds to finance the return to America of Lugosi and his wife who had supposedly been stranded in the UK after the Dracula tour collapsed with the cast unpaid. 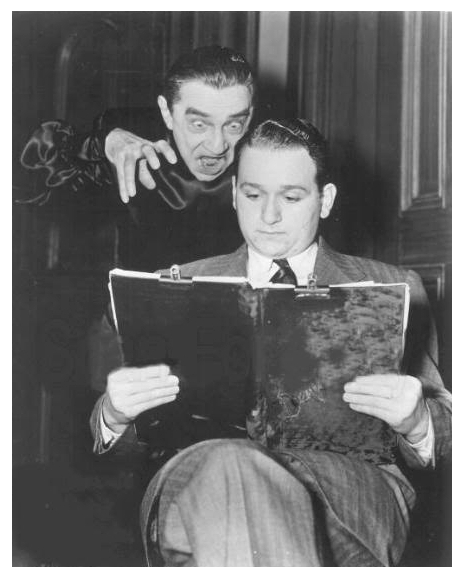 Lugosi’s participation in a new film was actually first announced in the Sheffield Telegraph on August 7, 1951, over two months before the end of the tour. 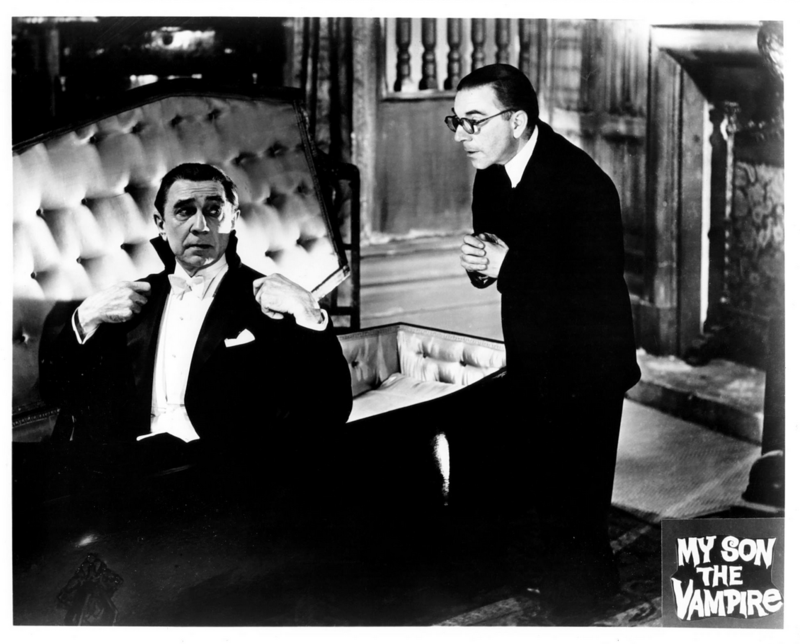 When the tour closed on October 13th, it was not due to a financial crisis, but at the request of Lugosi himself. The demands of the long tour simply proved too much for the ailing 68-year-old actor. 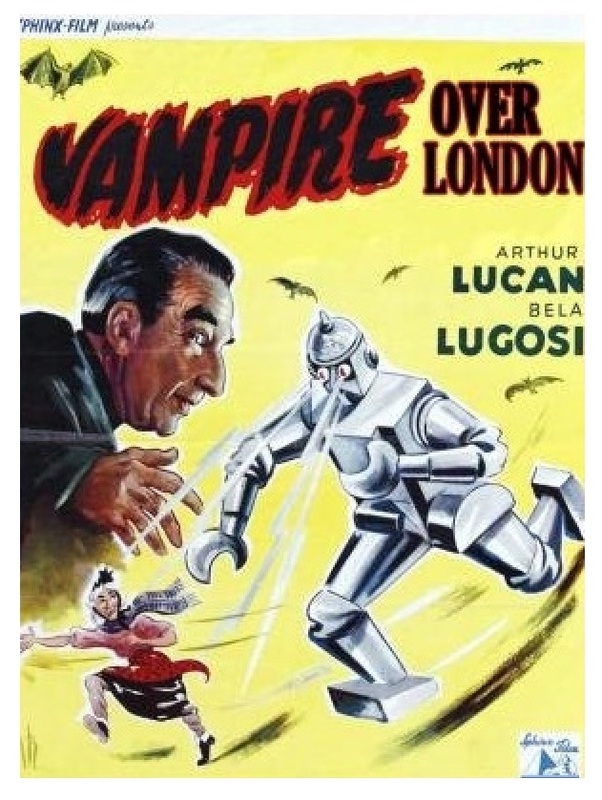 The film’s export title was Vampire over London, but it was also distributed in America by Jack H. Harris as The Vampire And The Robot and The Vampire. 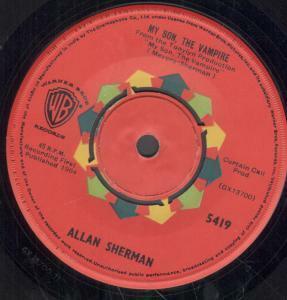 It was retitled again as My Son, The Vampire and given a new theme song by Allan Sherman when re-released in 1963. 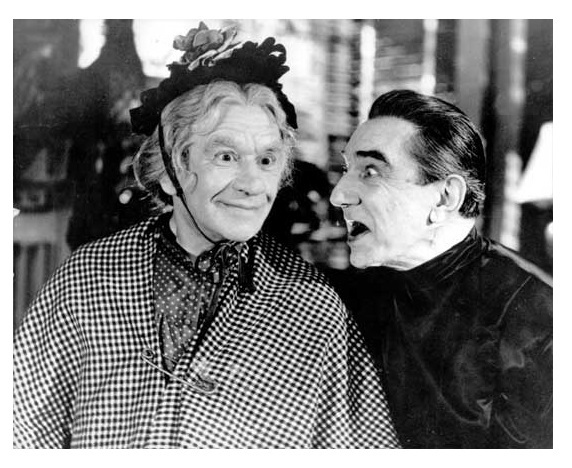 RENOWN’S next production at Nettlefold will be “Old Mother Riley Meets the Vampire,” and the stars will be Arthur Lucan and Bela Lugosi. It is expected that shooting will start in September, but no director has been appointed yet. In the meanwhile preparations are going forward for “Pickwick Papers,” with the hope that it will get on the floor in January or February. Noel Langley is writing the screenplay. Had a short pleasant talk here with George Minter, head of Renown Pictures, who is in New York to make a releasing deal for “Tom Brown’s Schooldays” and “A Christmas Carol.” Relaxing in an air-conditioned room at the Sherry-Netherlands while the rest of New York was sweltering under a blanket of hot moist air, Mr. Minter – immaculate in grey suit and grey tie – spoke of his plans. 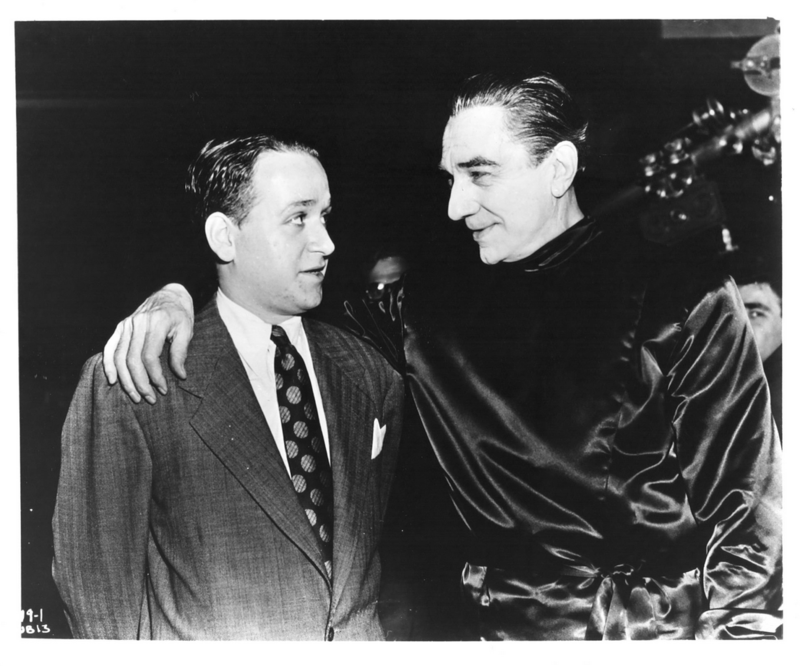 He was going to do another picture with Alistair Sim, he said, and would put “Vampire Over London,” with Bela Lugosi, before the cameras on October 29. GEORGE MINTER flew in from New York yesterday enthusiastic about the success of his deals for “Tom Brown’s Schooldays” and “Scrooge” in the Western Hemisphere (reported elsewhere in this issue) and the keen interest shown in his forthcoming “Pickwick Papers” which may be filmed in Technicolor in the New Year. Meanwhile, George is planning to make another film starring Alistair Sim some time between now and the end of the year. The subject, as yet untitled, is being specially written by Noel Langley. Another studio that is not suffering from empty stages is Nettlefold, where Coronado’s “Saturday Island” is well under way, and Raymond Stross’s “Tall Headlines” is due back next week after a fortnight on location locally and in Brighton. 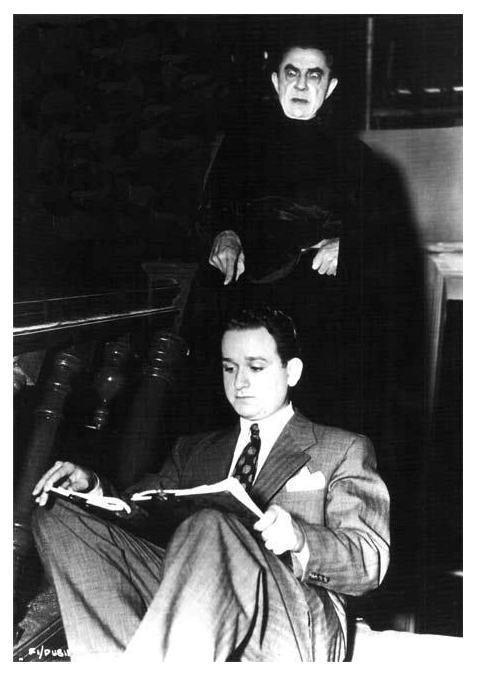 Next in will be Renown’s “Old Mother Riley Meets the Vampire,” and Nettlefold Films has a production scheduled by Ernest G. Roy for December. Which of two scripts will be chosen has not yet been decided. The “Saturday Island” unit had plenty of excitement during its first week, when part a ship built in the studio was “blown up.” Members of Jock Easton’s stunt team were used for the really strenuous moments. “Old Mother Riley” is making the social grade. 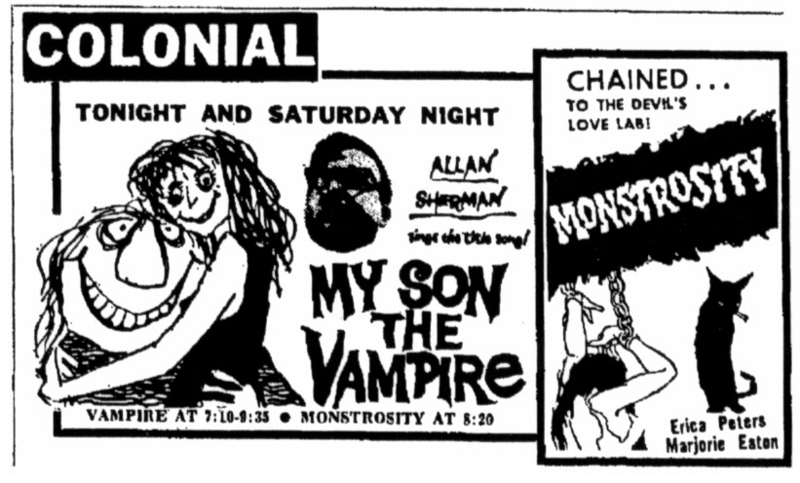 Some time ago, Arthur Lucan was given a lot more money to spend on his films. This has made them even more popular at the box-office. For the first time Kitty McShane will not be in the film. 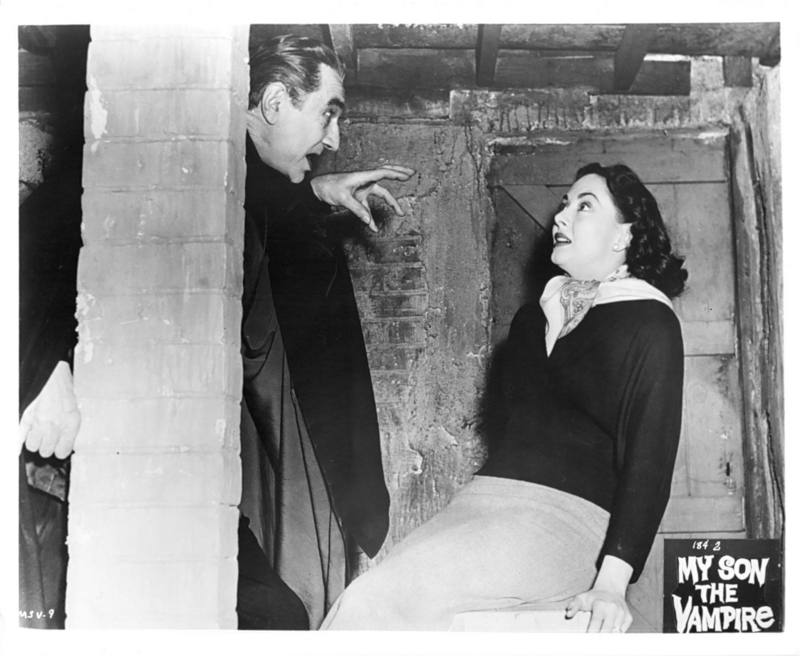 Frightened of vampires? Now the old lady is to have a Hollywood star for team-mate. 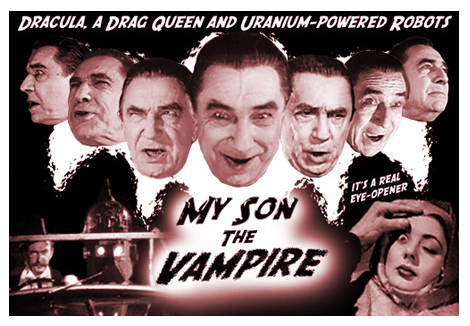 None other than the fearsome Bela Lugosi! 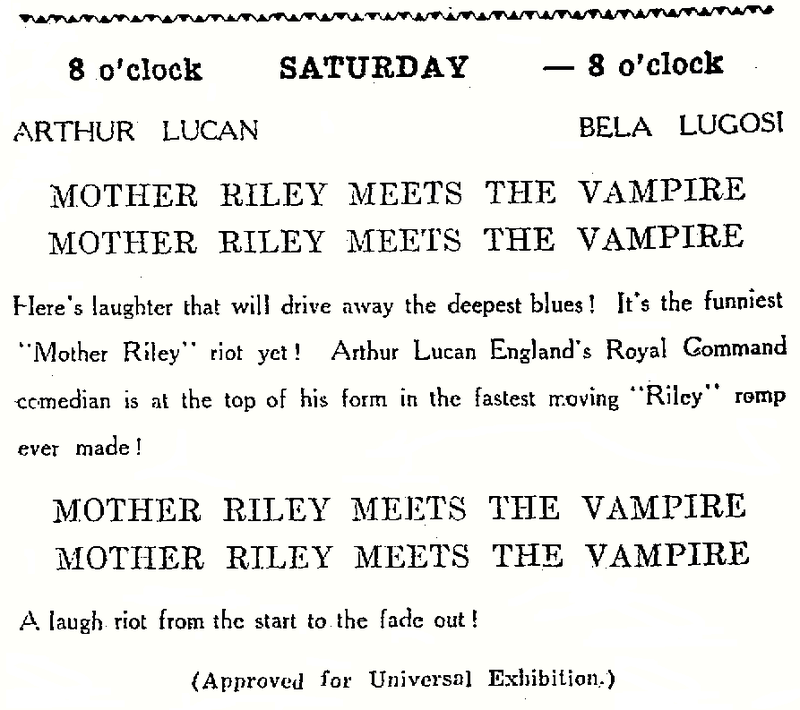 “Old Mother Riley Meets the Vampire” is the title. They begin to haunt each other next month. 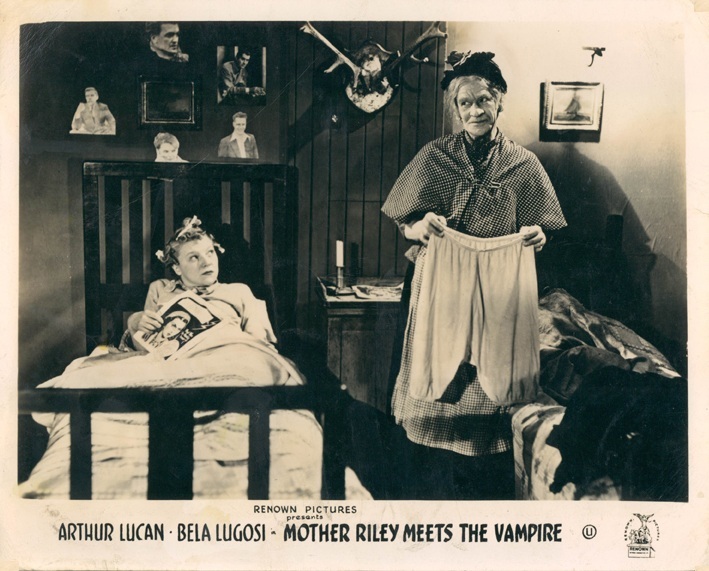 The picture will have two titles – Old Mother Riley Meets the Vampire” for British audiences; “The Vampire Over London” for other countries, including Australia. 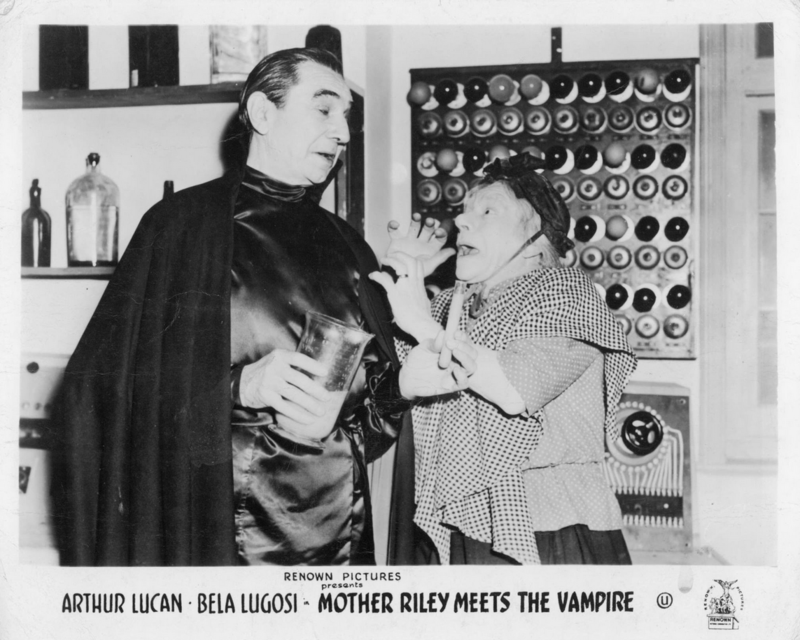 “Old Mother Riley Meets the Vampire,” starring Arthur Lucan and Bela (“Dracula”) Lugosi, went into production at Nettlefold on Monday. 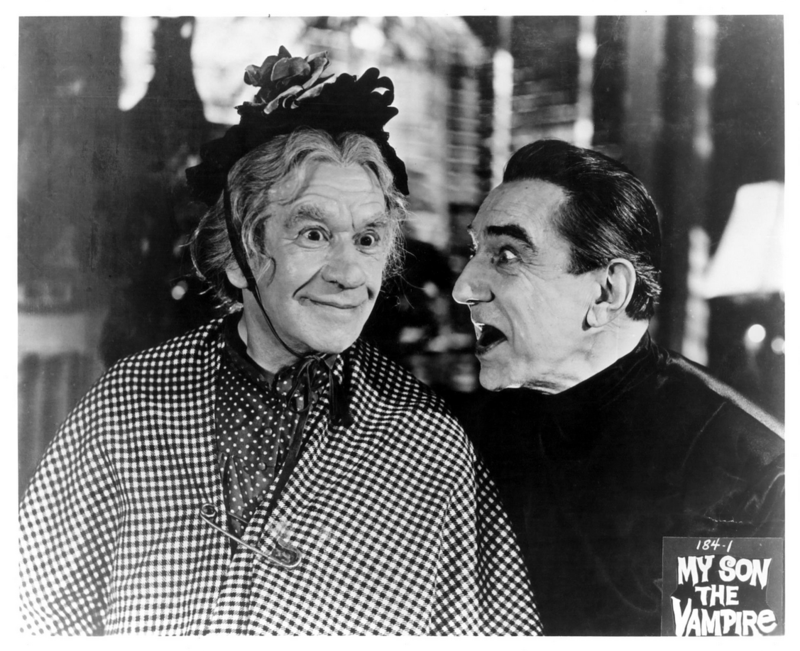 This Renown comedy is being directed by John Gilling from a screenplay by Val Valentine. 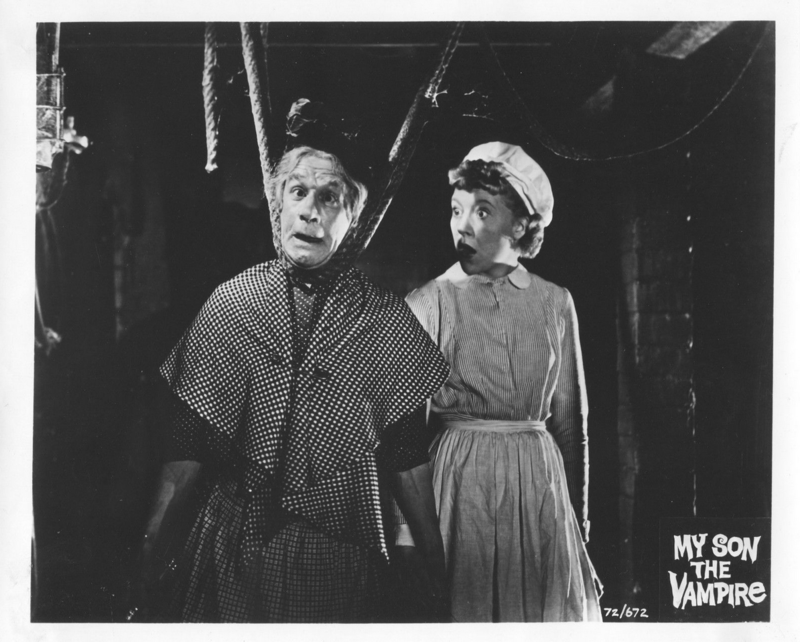 The cast includes Dora Byran, Judith Furse and Hattie Jacques. 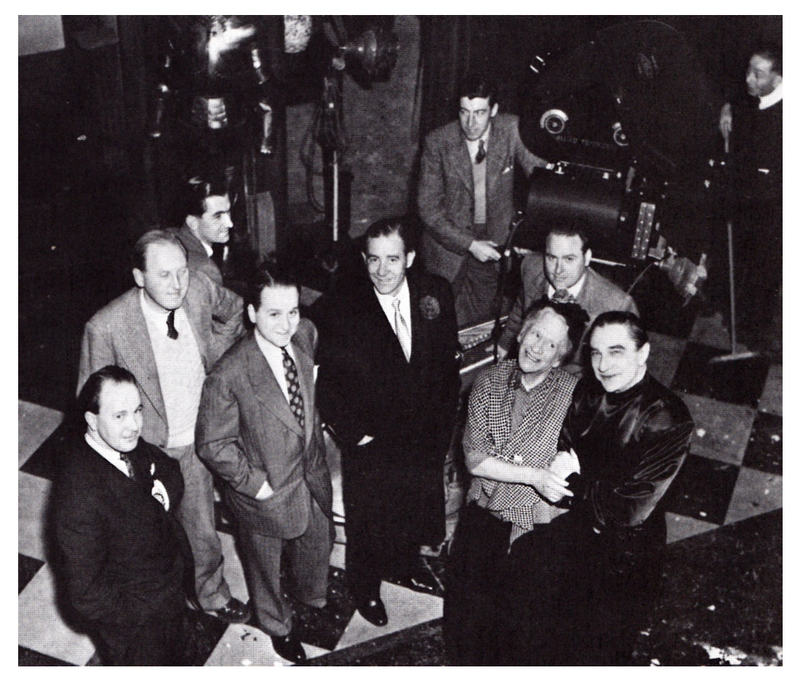 Production manager is Stanley Couzins; cameraman is Stan Pavey, and Denis O’Dell is first assistant. 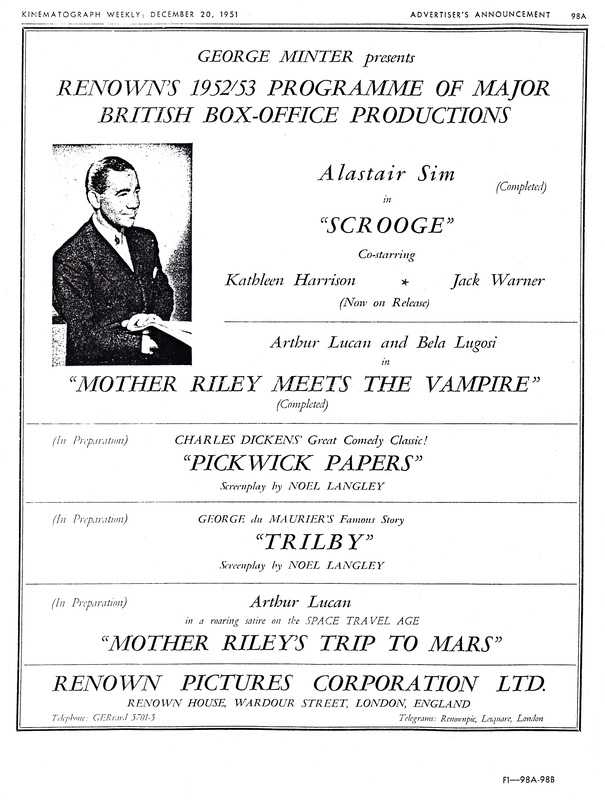 On November 22nd Bela and Lillian attended the premiere of Renown’s Scrooge at the Regal Marble Arch Cinema in London. Five pictures are scheduled for production in 1952 on the Renown programme, although it is not expected that more than three of them will be delivered during that period. One Technicolor subject will be delivered and another started during the year, but the subjects are not settled. Properties in preparation include Charles Dickens’s “Pickwick Papers,” George Du Mauriers’s “Trilby,” Sheridan’s “School for Scandal,” Thackeray’s “Vanity Fair,” and “Love of the Foolish Angel,” a story by Helen Beauclerk. Screen plays will be by Noel Langley. Another Mother Riley is also scheduled. “Mother Riley’s Trip to Mars,” which will be a broad comedy satire on the present atom bomb experiments and rocket trips to the moon. 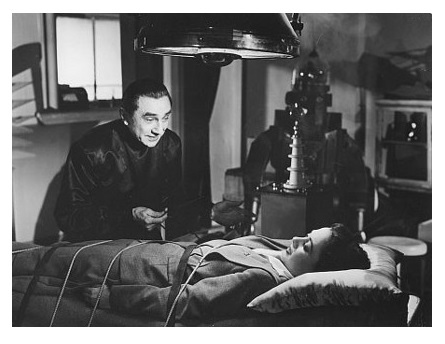 Also in preparation are two horror pictures, for which negotiations are proceeding to star Boris Karloff in one and Bela Lugosi in the other. These last three subjects will be in black and white. 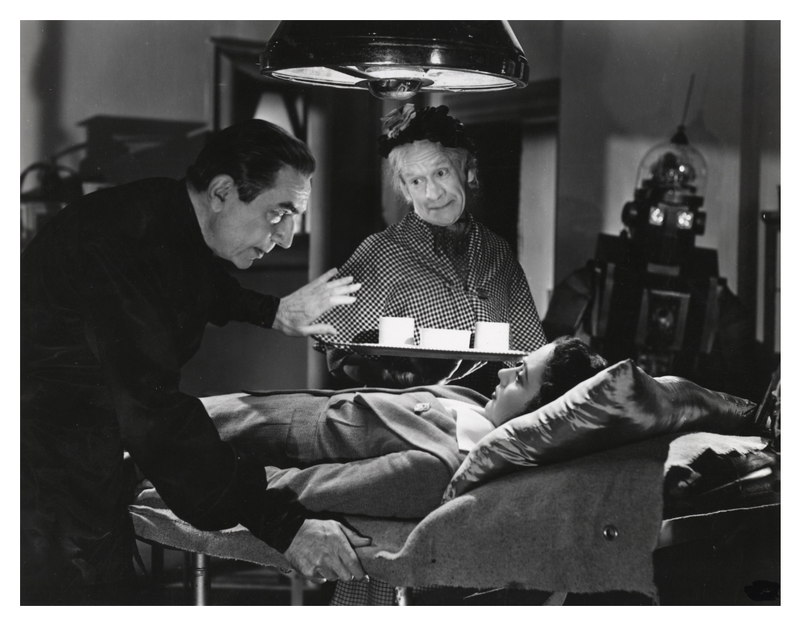 An extension of George Minter’s policy of filming classic works with the support of American finance and stars is announced by Renown Pictures. Of eight subjects scheduled for forthcoming production, four will be classic stories which Minter plans to make in colour. 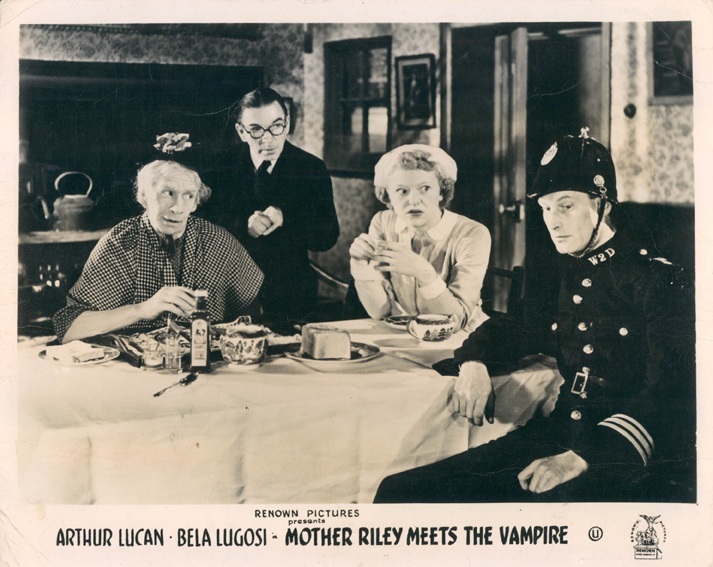 At the same time, Mr. Minter will continue to produce his “Mother Riley” comedies, the latest of which, “Mother Riley Meets the Vampire,” starring Arthur Lucan and Bela Lugosi, will shortly be on release. 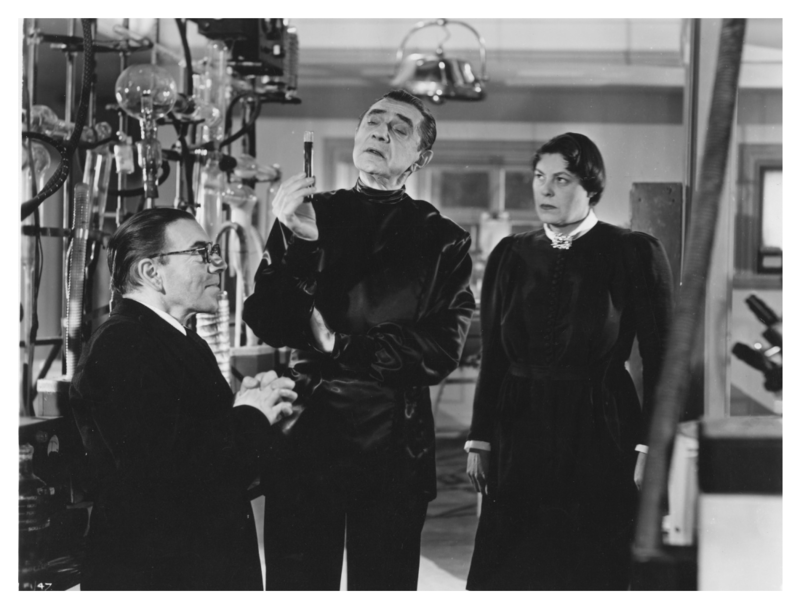 There will also be two horror subjects on the new Renown schedule, one of which will star Boris Karloff and the other Bela Lugosi. Exuberant story of how Mother Riley gets caught up with maniacal scientist trying to get procession of map of uranium deposit. 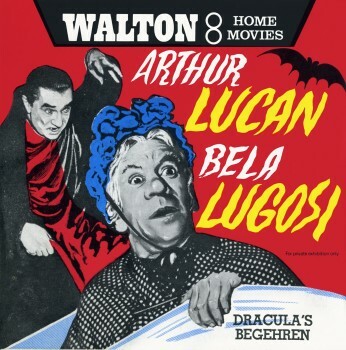 As in other films of the series, production relies primarily on Arthur Lucan’s celebrated dame act with its well-tried slapstick, teamed in this case with the amusing melodramatics of Bela Lugosi. 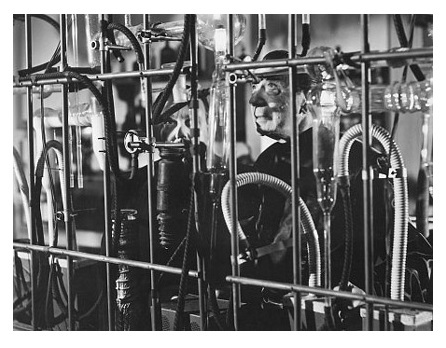 Comedy is largely a matter of Mother Riley’s preposterous antics in scientist’s sinister house, complete with secret passages, sliding panels and towering robot…Reliable entertainment for Mother Riley fans. Now that Abbott and Costello have Met The Ghosts, it looks as though all the other slapstick comedians are queueing up to have a go. But if we’re in for a comedy-thriller cycle, let’s hope that those to come are more efficiently put together than this lumbering collection of badly timed chestnuts. 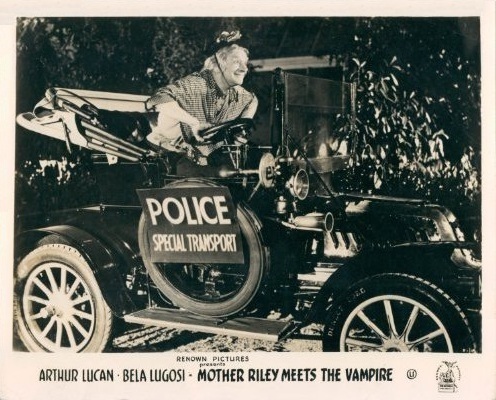 True,Arthur Lucan is in vigorous form, and Bela Lugosi gives one of his liveliest performances, but the script defeats them both. 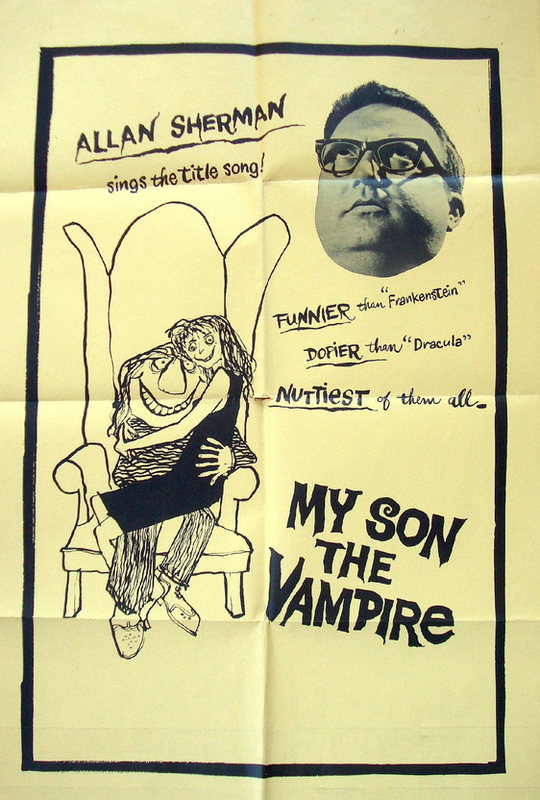 The best, and funniest, Mother Riley comedy will also be shown. 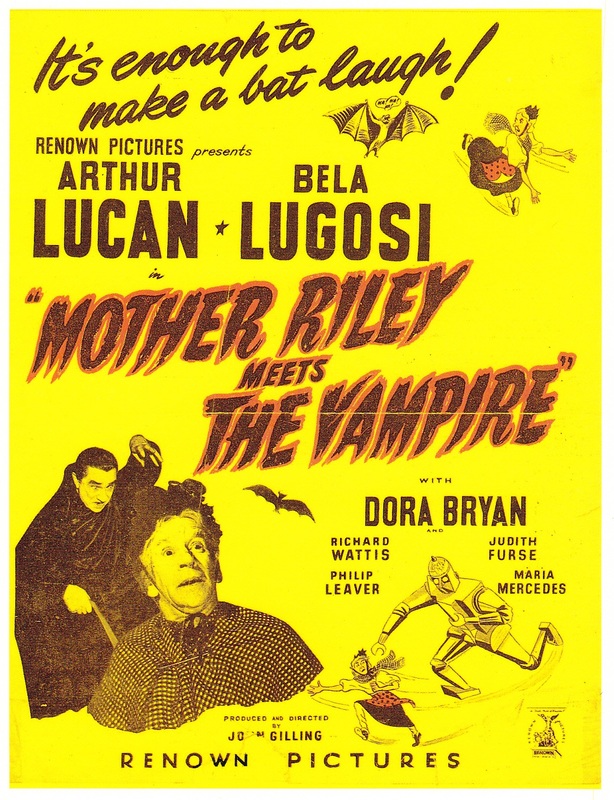 It is “Mother Riley Meets the Vampire,” and it teams for the first time Arthur Lucan and Bela Lugosi. When these two get together the result is one of the most hilarious comedies seen for a long time. 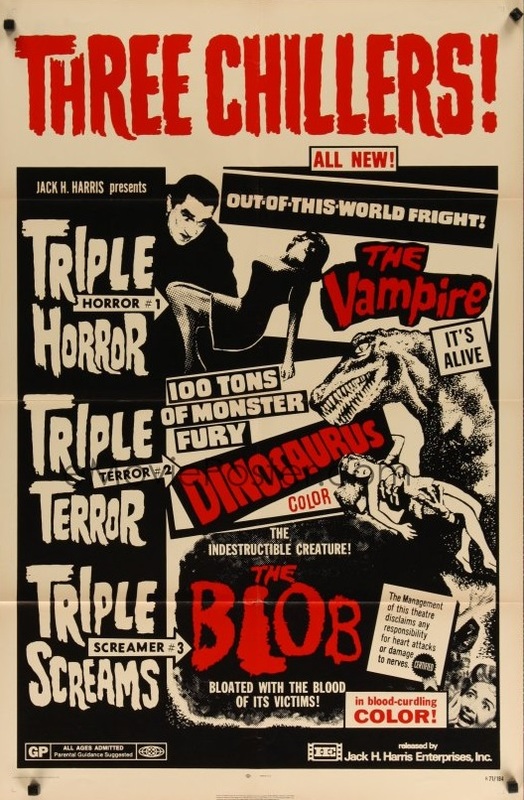 Showing at the Forum Cinema and Cafe. 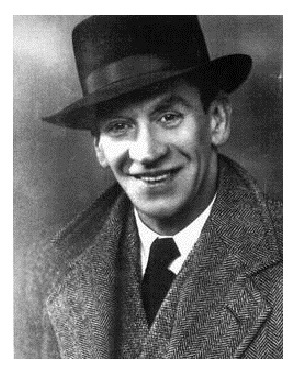 A rare portrait of Arthur Lucan out of his Mother Riley costume. He prefered to be the old washerwoman when he stepped into the spotlight so that he could enjoy the freedom of anonymity in his daily life. 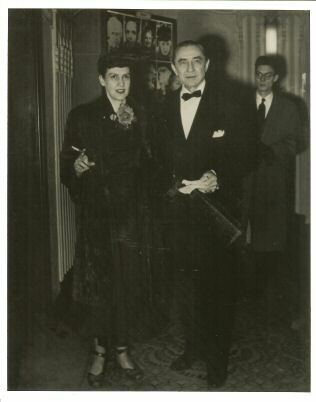 Bela interviewed aboard the Queen Elizabeth on his arrival in New York on December 11th, 1951, by Jack Mangan for the TV show Ship’s Reporter. 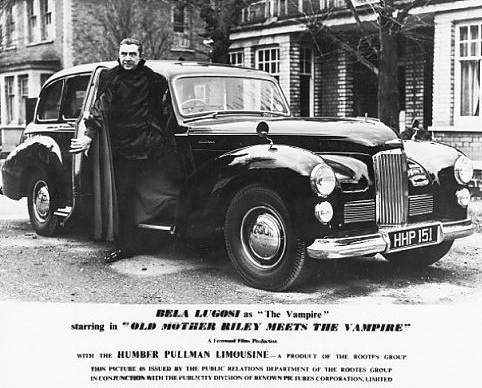 Bela talks about the British tour of Dracula and Mother Riley Meets The Vampire (referred to as Vampire Over London, the original American title). 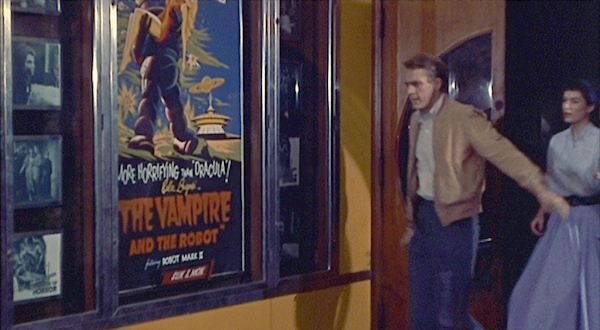 After filming, the costume was displayed in the foyer of a Birmingham cinema. It later spent over twenty years in a private collection in England before being auctioned, minus its glass dome, at Bonhams of London in December, 2010, when it sold for £1,680. It then found its way to California, where, with a new glass dome, it was auctioned in May, 2011, but failed to sell. 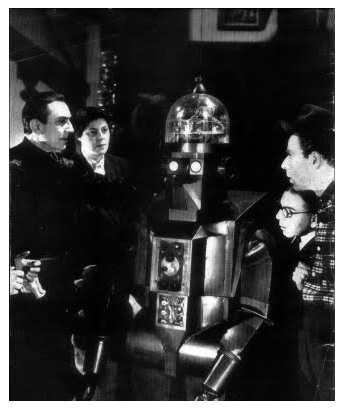 Bela, Judith Furse, Ian Wilson and David Hurst admire the robot. 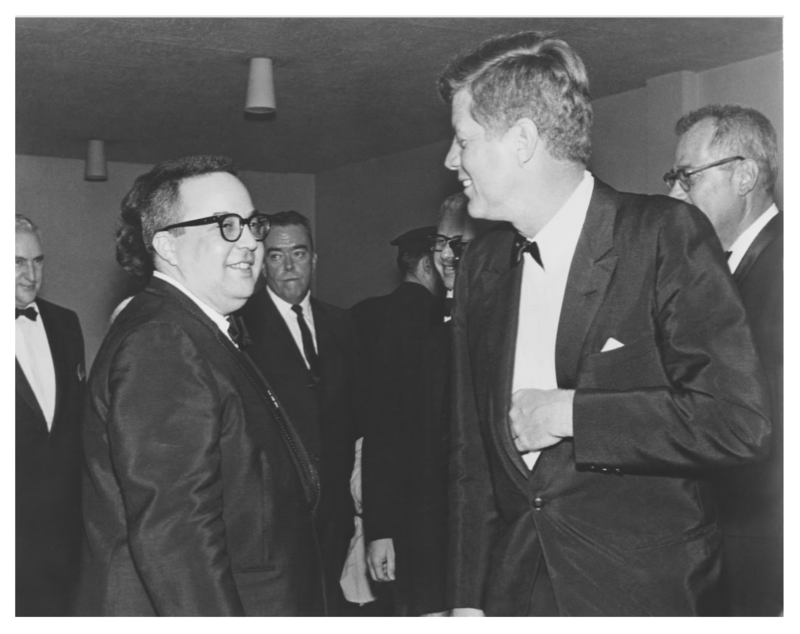 Released in the UK in 1964 by Warner Bros.
Allan Sherman pictured with John F. Kennedy, who unwittingly increased Sherman’s popularity and record sales when spotted singing his then current single, Sarah Jackman, in a hotel lobby in 1962.